The three elements are dynamically interrelated since each element is dependent on the others for effective communication to take place. The relationship between the source and the receiver is also dynamic and depends on the two-way flow of symbols between the source and the receiver. The source depends on feedback from the receiver to properly tailor the communication to the situation. The source also provides feedback to the receiver to reinforce the desired receiver responses. As indicated, the source in communication is the sender, speaker, writer, encoder, transmitter, or instructor. The effectiveness of persons acting in the role of communicators is related to at least three basic factors. First, their ability to select and use language is essential for transmitting symbols that are meaningful to listeners and readers. It is the responsibility of the speaker or writer, as the source of communication, to realize that the effectiveness of the communication is dependent on the receiver’s understanding of the symbols or words being used. For example, if an aviation maintenance instructor were to use aviation acronyms like ADs, TCDS or STCs or a flight instructor were to use aviation acronyms like ILS, TCAS, or TAWS with a new maintenance student or student pilot respectively, effective communication would be difficult if not impossible. 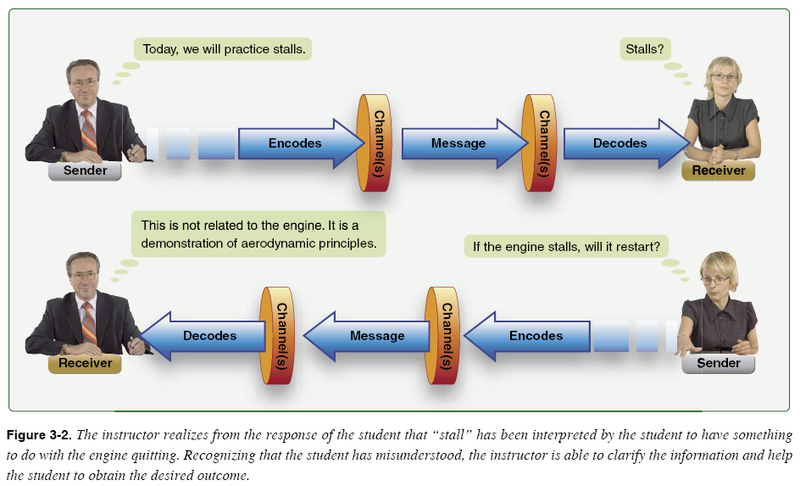 Use of aviation acronyms or technical language is necessary, but the student must be taught the language first. Conversely, a speaker or writer may rely on highly technical or professional background with its associated vocabulary while addressing a receiver with a similar background. Second, communicators consciously or unconsciously reveal attitudes toward themselves as a communicator, toward the ideas being communicated, and toward the receivers. These attitudes must be positive while delivering the message if they are to communicate effectively. Communicators must be confident; they should illustrate that the message is important and that the receiver has a need to know the ideas presented. Third, communicators are more likely to be successful when they speak or write from accurate, up-to-date, and stimulating material. Communicators must constantly strive to have the most current and interesting information possible. In this way, the receiver’s interest can be held. Out-of-date information causes the instructor to lose credibility in the eyes of the receiver. Use of monotonous or uninteresting information runs the risk of losing the receiver’s attention. At its basic level, communication is achieved through symbols, which are simple oral and visual codes. The words in the vocabulary constitute a basic code. Common gestures and facial expressions form another, but words and gestures alone do not communicate ideas. Ideas are communicated only when symbols are combined in meaningful wholes, as in ideas, sentences, paragraphs, speeches, or chapters that mean something to the receiver. When symbols are combined into these units, each portion becomes important to effective communication. On a higher level, communication through symbols is achieved by their interpretation through different perceptions, sometimes referred to as channels. While many theories have been proposed, one popular theory indicates that the symbols are perceived through one of three sensory channels: either visual, auditory, or kinethestic. As discussed in Chapter 2, visual learners rely on seeing, auditory prefers listening and speaking, while kinesthetic learners process and store information through physical experience such as touching, manipulating, using, or doing. The instructor will be more successful in gaining and retaining the student’s attention by using a variety of channels. As an example, instead of telling a student to adjust the trim, the instructor can move the trim wheel while the student tries to maintain a given aircraft attitude. The student experiences by feel that the trim wheel affects the amount of control stick pressure needed to maintain the attitude. At the same time, the instructor can explain to the student that what is felt is forward or back pressure on the control stick. After that, the student begins to understand the correct meaning of control pressure and trim, and when told to adjust the trim to relieve control pressure, the student responds in the manner desired by the instructor. Most frequently, communicators select the channels of hearing and seeing. For motor skills, the sense of touch, or kinesthetic learning, is added as the student practices the skill. The feedback an instructor is getting from a student needs to be constantly monitored in order to modify the symbols, as required, to optimize communication. [Figure 3-2] In addition to feedback received by the instructor from the students, students need feedback from the instructor on how they are doing. The feedback not only informs the students of their performance, but can also serve as a valuable source of motivation. An instructor’s praise builds the student’s self-confidence and reinforces favorable behavior. On the other hand, negative feedback must be used carefully. To avoid embarrassing a student, use negative feedback only in private. This information should be delivered as a description of actual performance and given in a nonjudgmental manner. For example, it would be appropriate to tell a maintenance student that a safety wire installation is not satisfactory. To refer to the work as careless would not be good and could do harm to the student’s feeling of self-worth. The parts of the total idea should be analyzed to determine which are most suited to starting or ending the communication, and which are best for the purpose of explaining, clarifying, or emphasizing. All of these functions are required for effective transmission of ideas. The process finally culminates in the determination of the medium best suited for their transmission.